300g essential Waitrose long grain rice. 1. Thaw the broad beans. Melt the butter in a large pan with the olive oil, add the onion and cook over a low heat until softened. Finely chop the garlic and add to the pan along with the rice. Fry for a minute, making sure the rice is well coated. 2. Prepare 1 litre of hot vegetable stock, using a the stock cube. Add the hot stock, a ladle at a time as the rice absorbs. Repeat until the rice is tender and creamy. While it is cooking, remove the outer skins of the broad beans, if you like, then cook in boiling water for 3 minutes. 3. Drain well. 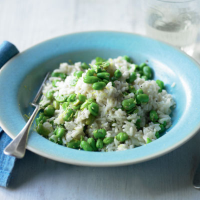 Add the broad beans and zest and juice of the lemon to the rice. Leave to rest for 2-3 minutes before serving. Add grated cheddar or parmesan, if you like.